Paul Kupperberg (born June 14, 1955) is a writer and executive editor at Charlton Neo Comics and Pix-C Webcomics, and a contributing author with Crazy 8 Press. Formerly, he was an editor for DC Comics and executive editor of Weekly World News, as well as a writer of novels, comic books, and newspaper strips. Paul Kupperberg entered the comics field from comics fandom. He and Paul Levitz produced the comics fanzine The Comic Reader between 1971 and 1973, and Etcetera between 1972–1973. 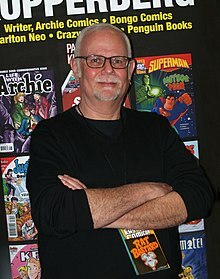 Kupperberg has written an estimated 1,000 comic book stories, primarily at DC, for the Julius Schwartz-edited Superman, Action Comics, Supergirl, and Superboy titles, as well as the new Doom Patrol, Vigilante, Green Lantern, The Brave and the Bold, Showcase, The Superman Family, House of Mystery, Weird War Tales, Justice League of America, Ghosts, Star Trek, Aquaman, Adventure Comics, The Savage Sword of Conan, and many others. He and artist Jan Duursema co-created the Arion character in The Warlord #55 (March 1982) and the Arion, Lord of Atlantis series was launched in November 1982. That same month saw the debut of The Daring New Adventures of Supergirl by Kupperberg and Carmine Infantino. Kupperberg scripted the first appearance of Keith Giffen's Ambush Bug character in DC Comics Presents #52 (Dec. 1982) A revival of the Doom Patrol series by Kupperberg and Steve Lightle began in October 1987 and Kupperberg and Steve Erwin launched the Checkmate! series six months later. Kupperberg created the Takion series as well. He wrote the syndicated The World's Greatest Superheroes newspaper comic strip with José Delbo from 1981–1985 and the Tom and Jerry newspaper strip from 1990–1991. Kupperberg wrote the first comic book miniseries, The World of Krypton in 1979 and co-wrote Secrets of the Legion of Super-Heroes the following year with E. Nelson Bridwell. Kupperberg was one of the contributors to the DC Challenge limited series in 1986 and his other mini-series include The Phantom Stranger (with Mike Mignola and P. Craig Russell), Power Girl, Peacemaker, Super Powers (with Jack Kirby), and the first comic book adaptation of He-Man and the Masters of the Universe. He has also written movie parodies and humor for Marvel's Crazy Magazine (1977–1983), the series "Trash" for Britain's 2000 AD, with artist Nigel Dobbyn, and The Online Multipath Adventures of Superman web-animation (1998). Most of his current comic book writing appears in the DC-published Cartoon Network licensed comics on such characters as Johnny Bravo, I.M. Weasel, Hi Hi Puffy AmiYumi, and Scooby-Doo. Kupperberg's prose credits include The Atlas to the DC Universe (Mayfair Games, 1992), The Doom Patrol Sourcebook (Mayfair Games, 1993), and the Spider-Man novels Crime Campaign and Murdermoon (both Pocket Books, 1979). He has had short stories published in the anthologies The Further Adventures of Batman Featuring Catwoman (Bantam Books, 1993), Fear Itself (Warner Books, 1995), Superheroes (Ace Books, 1995, edited by John Varley) and Oceans of Magic (DAW Books, 2001). His adult novel, JSA: Ragnarok, was scheduled to be published in 2006 but has been indefinitely delayed due to the bankruptcy of its publisher, iBooks. His other published work includes the young adult novel Wishbone Mysteries: The Sirian Conspiracy (co-written with Michael Jan Friedman, Big Red Chair Books, 1999), as well as color and activity books featuring Firehouse Tales. In 2005, Kupperberg began writing for the weekly satiric and humor tabloid, Weekly World News. From 1981–1982 Kupperberg was assistant editor on Video Action Magazine, one of the first newsstand magazines to focus on the then burgeoning home video market. He also wrote numerous articles for the magazine. Among his other non-fiction work are many introductions and historic prefaces to various DC collected editions and Archives ('The Essential Showcase', The Flash Archives Volume 1, Action Comics Archives Volume 2, etc. ), as well as essays for the anthology You Did What? : Mad Plans And Great Historical Disasters (Harper Paperbacks, 2004). Since 2003, Kupperberg has written numerous non-fiction books for young adults, including: Spy Satellites, The Tragedy Of The Titanic, Astronaut Biographies: John Glenn (a Society Of School Librarians International Honor Book, 2004), Critical Perspectives On The Great Depression, The Nature Of Disease, Edwin Hubble And The Big Bang, The History Of The New York Colony, Rodeo Clowns, Origins Of The Action Heroes: Spider-Man, Cutting Edge Careers In Robotics, and In The News: Hurricanes for Rosen Publishing. From 1991–2006, Kupperberg was on staff at DC Comics, editing such titles as The Flash, Wonder Woman, Jack Kirby's Fourth World, Impulse, Peter Cannon, Thunderbolt and others. He also edited in DC's Licensed Publishing department, overseeing such titles as MADvertising: A MAD Look at 50 Years of MADison Avenue by David Shayne, Marv Wolfman's novelization of his landmark comics series Crisis on Infinite Earths, a trilogy of Green Lantern novels by Christopher Priest, Mike Baron and Mike Ahn (both novel and trilogy were published by iBooks), and dozens of MAD reprints, kids storybooks, young adult novels and children's color and activity books based on DC Comics properties. In early 2006, Kupperberg left DC to become senior editor at the Weekly World News. In 2007, he contributed to the Doctor Who short-story collection Short Trips: Destination Prague, and The Avenger Chronicles from Moonstone Books. The Weekly World News ceased publication in August 2007, and in January 2008, Kupperberg became senior editor of WWE KIDS for World Wrestling Entertainment. He is freelancing and consulting for DC Comics, Archie Comics, Moonstone Publishing, Stone Arch Books, Bongo Comics, GIT Corp, and others. He wrote the Harvey Award and Eisner Award nominated Life with Archie series for Archie Comics which began in August 2010 in the second issue of Life With Archie: The Married Life, in magazine format. The series continue the Michael Uslan/Stan Goldberg best-selling Archie wedding series, two ongoing series each featuring one of Archie's two possible futures, one married to Betty Cooper and another married to Veronica Lodge. The series also featured the controversial gay marriage of Kevin Keller (the first gay character in the Archie Comics Universe) and ended with the 2014 "The Death of Archie" story line, which made news all over the world. He wrote the young adult novel Kevin (Penguin Books), which was nominated for a GLAAD Media Award and won the 2014 Scribe Award from the International Association of Media Tir-In Writers. He has written Captain Action Classified, children's books based on Superman, Batman, and Wonder Woman for Stone Arch Books, and numerous color and activity books based on DreamWorks properties for Dalmatian Press, as well as Mad Libs featuring Archie, DC Superheroes, and Marvel Superheroes. Kupperberg is currently executive editor of Charlton Neo and the online webcomics site, Pix-C, for which he has created numerous titles and features, including Paul Kupperberg's Secret Romances, Unusual Tales featuring N.E.O., "The Scarry Squad," "Edison Corliss' Industrial Steam and Ironworks," "Digger Graves, Paranormal P.I.," and "Blank." He is also one of the seven authors behind Crazy 8 Press, a publishing hub and imprint with Robert Greenberger, Michael Jan Friedman, Aaron Rosenberg, Peter David, and others through which he has published his novel The Same Old Story and short story collection, In My Shorts: Hitler's Bellhop and Other Stories as well as contributed to such Crazy 8 anthologies as ReDeus, co-created with Greenberger and Rosenberg, Pangaea, and Tales of the Crimson Keep. Kupperberg's brother, Alan Kupperberg (1953–2015), also worked in the comic book field as an artist and writer. DC Comics — introductions and historic forewords for collected editions of classic comic books, including Action Comics Archive Vol. 2, The Flash Archives Vol. 1, Challengers of The Unknown Archives Vol. 1, Superman: Whatever Happened To The Man Of Tomorrow?, The Essential Showcase, The Doom Patrol Archives Col. 3, Superman: The World Of Krypton, and Superman: The Bottle City Of Kandor. ^ Browning, Michael (July 2013). "The Doom Patrol Interviews: Paul Kupperberg". Back Issue!. Raleigh, North Carolina: TwoMorrows Publishing (65): 42–45. ^ Wallace, Dan (2008). "Arion, Lord of Atlantis". In Dougall, Alastair. The DC Comics Encyclopedia. London, United Kingdom: Dorling Kindersley. p. 24. ISBN 0-7566-4119-5. ^ Manning, Matthew K. "1980s" in Dolan, p. 198 "With the guidance of writer Paul Kupperberg and prolific artist Carmine Infantino, Supergirl found a home in the city of Chicago in a new ongoing series." ^ Manning "1980s" in Dolan, p. 199: "[Ambush Bug] made his debut in the pages of DC Comics Presents #52...[by] writer Paul Kupperberg and artist Keith Giffen." ^ Manning "1980s" in Dolan, p. 229: "October  saw a new Doom Patrol series, by writer Paul Kupperberg and artist Steve Lightle." ^ Manning "1980s" in Dolan, p. 235: "The clandestine government operation Checkmate began its monthly adventures in April  in its self-titled ongoing series by writer Paul Kupperberg and artist Steve Erwin." ^ McAvennie "1970s" in Dolan, p. 181: "The worldwide success of Superman: The Movie motivated [DC] to publish more Superman-related titles. With that, editor E. Nelson Bridwell oversaw a project that evolved into comics' first official limited series – World of Krypton...Featuring out-of-this-world artwork from Howard Chaykin, [Paul] Kupperberg's three-issue limited series explored Superman's homeworld." ^ Callahan, Tim (February 2013). "World of Krypton Comics' First Miniseries". Back Issue!. Raleigh, North Carolina: TwoMorrows Publishing (62): 59–62. ^ Manning "1980s" in Dolan, p. 192: "This was DC's third foray into the world of the world of the miniseries...Plotted by E. Nelson Bridwell, with a script by Paul Kupperberg, Secrets of the Legion of Super-Heroes featured the art of Jim Janes." ^ Greenberger, Robert (August 2017). "It Sounded Like a Good Idea at the Time: A Look at the DC Challenge!". Back Issue!. Raleigh, North Carolina: TwoMorrows Publishing (98): 40. Wikimedia Commons has media related to Paul Kupperberg.